The next period of the apostle Paul's life opens with the start of his third missionary journey in the summer of 53 A.D. (Acts 18:23). He leaves Antioch in Syria and heads west toward his hometown of Tarsus. He then revisits, for the third time, the cities of Derbe, Lystra, Iconium and Pisdian Antioch. In the short stay which Paul had made at Ephesus on his return from his second journey, he had promised to come again to that city, if the providence of God should allow it. This promise he was enabled to fulfill, after a hasty visit to the metropolis of the Jewish nation, and a longer sojourn in the first metropolis of the Gentile Church. 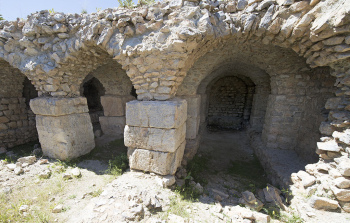 It is evident that it was not Apostle Paul's only object to proceed with all haste to Ephesus, nor indeed is it credible that he could pass through the regions of Cilicia and Lycaonia, Phrygia and Galatia, without remaining to confirm those churches which he had founded himself, and some of which he had visited twice. We are plainly told that his journey was occupied in this work, and the few words which refer to this subject imply a systematic visitation. Paul would be the more anxious to establish them in the true principles of the Gospel, in proportion as he was aware of the widely-spreading influence of the Judaizers. How did Paul use sarcasm to teach? It may be considered probable that Timothy was with the Apostle through the whole of this journey. Abundant mention of him is made, both in the Acts and the Epistles, in connection with Apostle Paul's stay at Ephesus and his subsequent movements (Acts 19:22, 20:4, 1Corinthians 4:17, 16:10, 2Corinthians 1:1, Romans 16:21). from the first century A.D.
Of the other companions who were undoubtedly with Paul at Ephesus, and who may have traveled with him from Syrian Antioch on his third journey, or went with him after he left Ephesus, we cannot say with confidence. Erastus, however, may have remained with him since the time of his first visit to Corinth (Acts 19:22), and Caius and Aristarchus (Acts 19:29) since the still earlier period of his journey through Macedonia. Whatever might be the exact route which the Apostle Paul followed from Antioch in Syria to Ephesus, he would certainly have revisited those churches which before had known him as their teacher. He would pass over the Cilician plain on the warm southern shore, and the high table land of Lycaonia on the other side of the Pass of Taurus. Paul would see once more his own early home on the banks of the Cydnus and Timothy would be once more in the scenes of his childhood at the base of the Kara-Dagh. After leaving Tarsus, the cities of Derbe, Lystra, and Iconium, as well as Antioch in Pisidia, would be the primary objects in Paul's progress. Then we come to Phrygia, a vague and indeterminate district which he had visited at least once before (Acts 16:6). The great road from Ephesus ran east near the cities of Laodicea, Colossae and Hierapolis, then continued to Iconium and ultimately to the Euphrates. We should naturally suppose that the Apostle would approach the capital of Asia along this well-traveled line. But the arguments are so strong for believing that Apostle Paul was never personally at Colossae (see Colossians 2:1), that it is safer to imagine him following some road farther to the north. Thus, then, we may conceive Paul, during his third evangelistic journey, arrived at that region where he was formerly in hesitation concerning his future progress (Acts 16:6 - 8) and then making his way to Ephesus. What islands did the apostle evangelize?